What is a scratch render? Scratch render (otherwise known as monocouche or ‘Krend’) is a relatively new process, coming over to the UK from the continent around ten years ago. 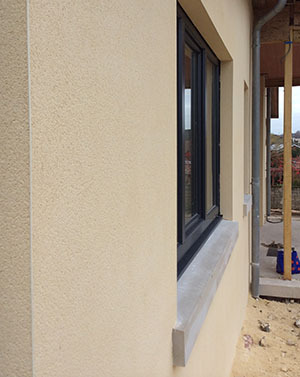 It is a coloured, cementitious render that can be used both inside and outside. Once the render is applied, the flat surface is scratched with a nail float, creating an attractive weathered stone look and giving the process its name. Coming in 30 colours, this through-coloured rendering method gives a crisp, clean finish. The colour will not fade – if it gets grubby simply take a pressure washer to it and it will be as good as new. The unique cement-ion formula allows moisture to escape through the render, fending off damp and allowing your building to breathe. What is the MCQ Plaster Co. Method? This is a more expensive method than a basic render, but our machine application means it is a lot quicker. Scratch renders only need one coat, rather than a couple. In the commercial and domestic plastering industry.